Last Tuesday on frigidly cold and snowy afternoon, I did a handful of junior and co-feature editor Kirstin Riggs’ chores. 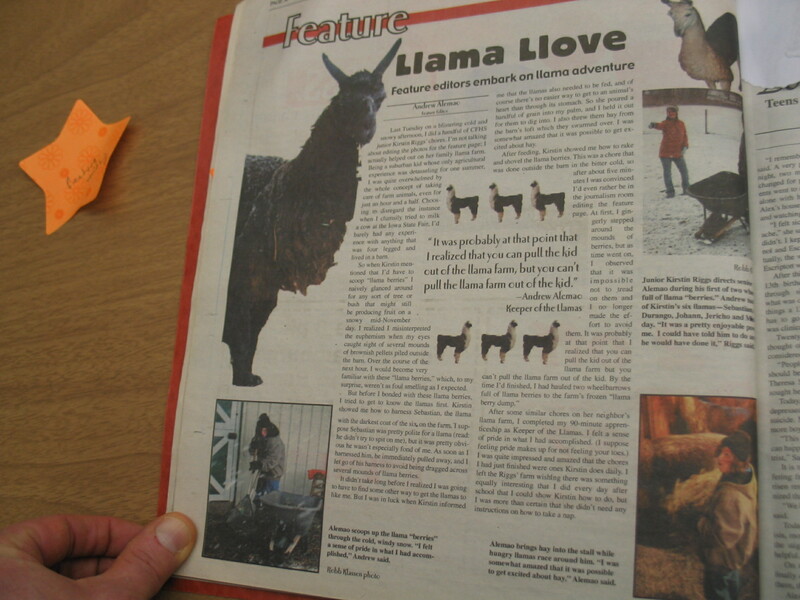 I’m not talking about editing the photos for the feature page; I actually helped out on her family llama farm. 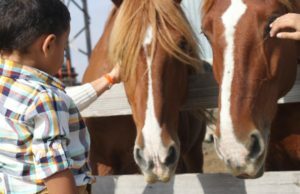 Being a suburban kid whose only agricultural experience was detasseling for one summer, I was quite overwhelmed by the whole concept of taking care of farm animals, even for just an hour and a half. Choosing to disregard the instance when I clumsily tried to milk a cow at the Iowa State Fair, I’d barely had nay experience with anything that was four-legged and lived in a barn. So when Kirstin mentioned that I’d have to scoop “llama berries” I naively glanced around for any sort of tree or bush that might still be producing fruit on a snowy med-November day. I realized I misinterpreted the euphemism when my eyes caught sight of several mounds of brownish pellets piled outside the barn. Over the course of the next hour, I would become very familiar with these ‘llama berries,” which, to my surprise, weren’t as foul smelling as I’d expected. But before I bonded with these berries, I tried to get to know the llamas first. Kirstin showed me how to harness Sebastian, the llama with the darkest coat of the six on the farm. I supposed Sebastian was pretty polite for a llama (read: he didn’t try to spit on me), but it was pretty obvious he wasn’t especially fond of me. As soon as I harnessed him, he immediately pulled away, and I let go of his harness to avoid being dragged across several mounds of llama berries. It didn’t take long before I realized I was going to have to find some other way to get the llamas to like me. But I was in luck when Kirstin informed me that the llamas also needed to be fed, and of course there’s no easier way to get to an animal’s heart than through its stomach. So she poured a handful of grain into my palm, and I held it out for them to dig into. I also threw them hay from the barn’s loft, which they swarmed over. I was somewhat amazed that it was possible to get excited about hay. After some similar chores on her neighbor’s llama farm, I completed my 90-mintue apprenticeship as Keeper of the Llamas. I felt a sense of pride in what I had accomplished. (I suppose feeling pride makes up for not feeling you toes.) I was quite impressed and amazed that the chores I had just finished were ones Kirstin does daily. I left the Riggs’ farm wishing there was something equally interesting that I did every day after school that I could show Kirstin how to do, but I was more than certain that she didn’t need any instructions on how to take a nap.